Grounds manager Keith Eberly accepts the Merit Award in Kentucky on behalf of Burlington Grounds Department. 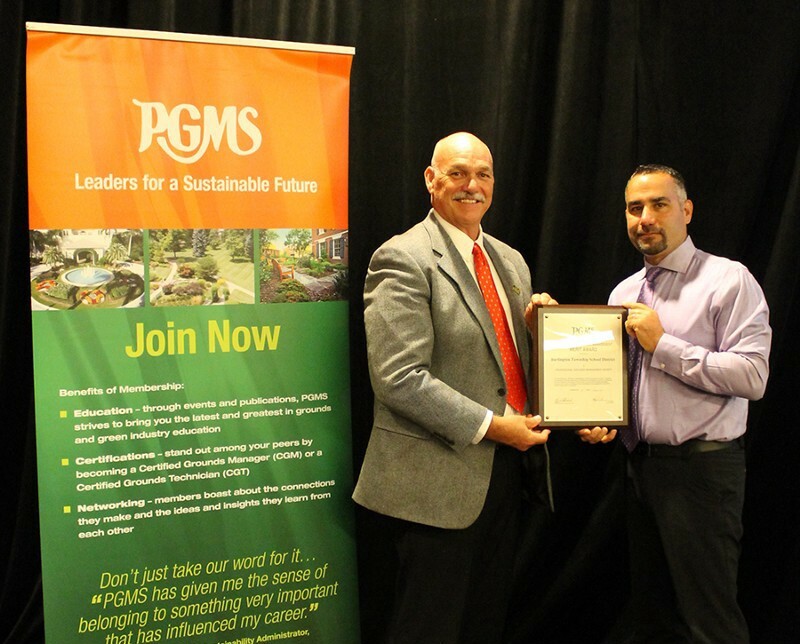 The Professional Grounds Management Society (PGMS) recognized Burlington Township School District in Burlington County, N.J. with a Merit Award in the Society’s 2017 Green Star Awards® competition. The award was given in the School Grounds (K-12, Technical Schools, Community Colleges) category for exceptional grounds maintenance. Winners were honored during the Society’s 2017 Awards Dinner on Oct. 20 in conjunction with the School of Grounds Management & GIE+EXPO in Louisville, KY, Oct. 18–21. The Grounds Department takes great pride in maintaining the properties of Burlington Township. From sports fields to common areas, they are always looking to improve the turf. Throughout the year, annuals are planted in the beds for beauty in every season. Winter months are busy clearing snow and getting equipment ready for spring. The Green Star Awards program brings national recognition to grounds maintained with a high degree of excellence, complimenting other national landscape award programs that recognize outstanding landscape design and construction. Overall, PGMS presented seven Grand Awards, its highest honor, as well as 23 Honor Awards and six Merit Awards in thirteen categories of competition. To view a complete list of winners please click here.